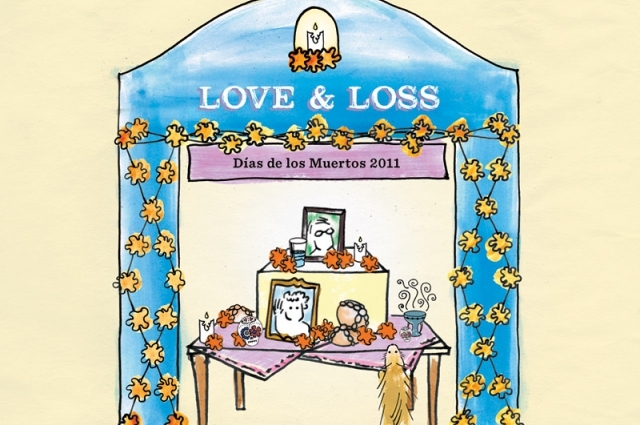 I finished the touring of “Dias de los Muertos: Love and Loss” in the fall of 2011. The exhibition of all of the ofrendas opened on October 12 and ended December 11. Over the nine weeks, docents each gave 15 tours for this heavily attended event. By December, I was ready for a break. By January, the familiar flyer on goldenrod-colored paper arrived in the mail: It was time for Gold Rush Guide training for another year. Already! The training was much less intense for me this time. Mitchell, our instructor, went over the material we needed to review. New Gold Rush Guides were charged to learn for the first time what some of us had already dedicated weeks of study to last year. Since those of us returning were feeling a bit smug, as we passed the quizzes with ease, Mitchell suggested that we choose several of the gallery bays to examine deeper into their why and bring that deeper involvement to our tours. I discovered a myth that partnered with a gallery painting depicting the creation of the world by Dalbert Castro Nisenan, called The Maidu Tree of Life. The oak tree, particularly the black oak, was almost literally the “tree of life” for all northern California valley, foothill and mountain Indians. 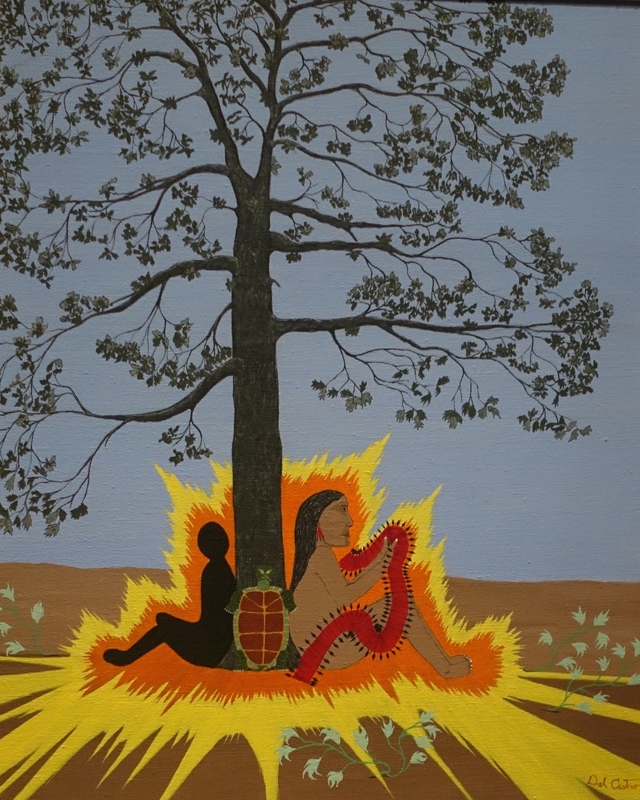 In this painting, Akatim, the World-maker, rests with Awan, the Turtle, and Kakinim Maidyk, Spirit Man, at the base of the “Tree of Life” after creating the world. Wanting to find out more about this painting, I checked the museum schedule and found the Indian Lifeways tour would be given the following day. 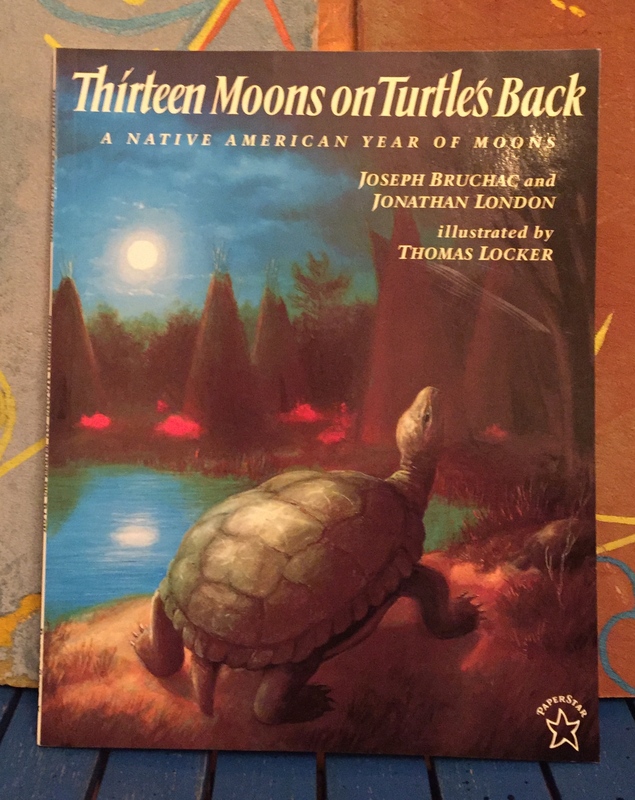 Meanwhile, I found a book called Thirteen Moons on Turtle’s Back by Joseph Bruchac and Jonathan London, a collection of myths about the moons during the year and the Native American stories that go with the myths. “The Moon When Acorns Appear,” a Pomo story from northern California, is one of the myths that connect to this painting. The Indians believed that the first “people” were the plants, grasses and animals. We humans are the “other people,” hence the name of the museum’s Native Peoples’ gallery, Before the Other People Came. When the world was just new, it was all water and the Creator put mud on the turtle’s back so that the humans could come. Creator thought about what else the humans would need in order to come. So, Creator put the sun and the stars in the sky. Creator then made a tree with branches that would make acorns when the sun shown on it. So each year when the sun shines the brightest, the first acorns come and the Pomo harvest them. The next day I showed up early at the museum for the Tour. Several visitors were grouped around the very painting I wanted to learn more about! I went over and introduced myself as a docent and asked if they knew anything or had any questions about the painting. One of them asked me what I knew, and I told him I knew it represented a Maidu Creation Myth, but wanted to know more. Sea Turtle complied and disappeared into the deep ocean for six years. Then Creator decided that Sea Turtle had enough mud and Creator yanked on the vine and Sea Turtle came up. Coyote helped dig out the mud from the claws and rolled it into a ball and put it on the raft. The ball grew and grew and became the earth. Then Creator planted a black acorn and a tree grew and the humans came. I’d come for an Indian Life Ways tour, and I’d received a tour from a Pomo Indian! The previous year, I rarely touched on this painting during my tours. Now I had a new story from someone who had grown up with creation myths. Later in the day I looked up Maidu Creation Myth and found this link. 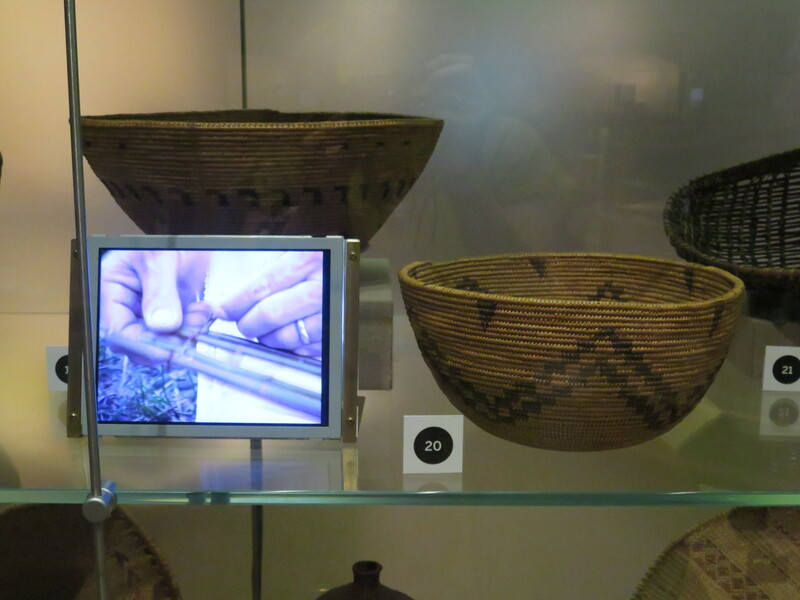 When the museum remodeled the History Gallery in 2009, we added interactive elements: video screens, tactile displays and audio elements. In the Native American section, we received help from our Museum’s Native American Advisory Council, who helped the curators decide on some of the groupings in the gallery. When it came to our Wall of Baskets, we had them help us as well. The baskets were arranged and labeled and the glass window was installed and the lights turned on. The curators didn’t think that video screens were appropriate—a little too much technology with this exquisite handcraft. 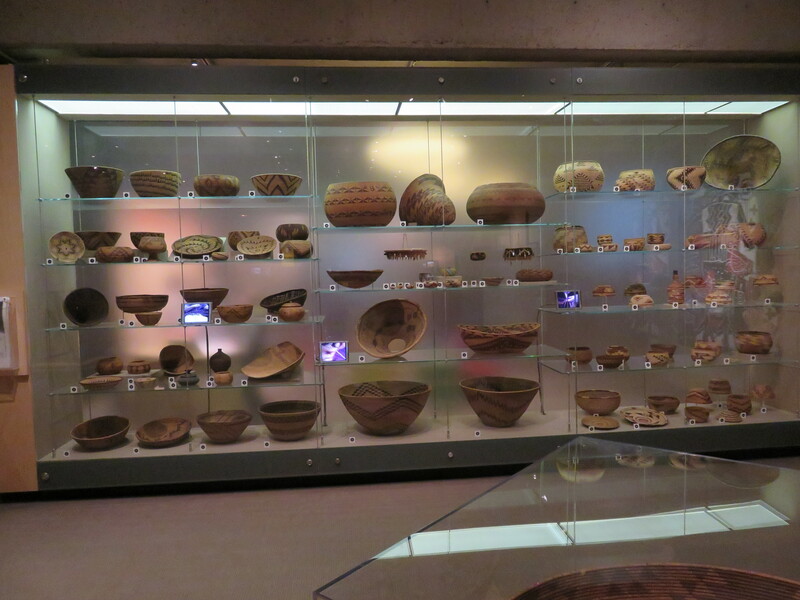 When the Gallery opened in 2010 with all the new interactive elements, the Native American Advisory Council wanted to make a change to the basket wall. They wanted video screens of hands weaving baskets. That seemed to make sense. However, it was not for the reason that the curators originally thought. 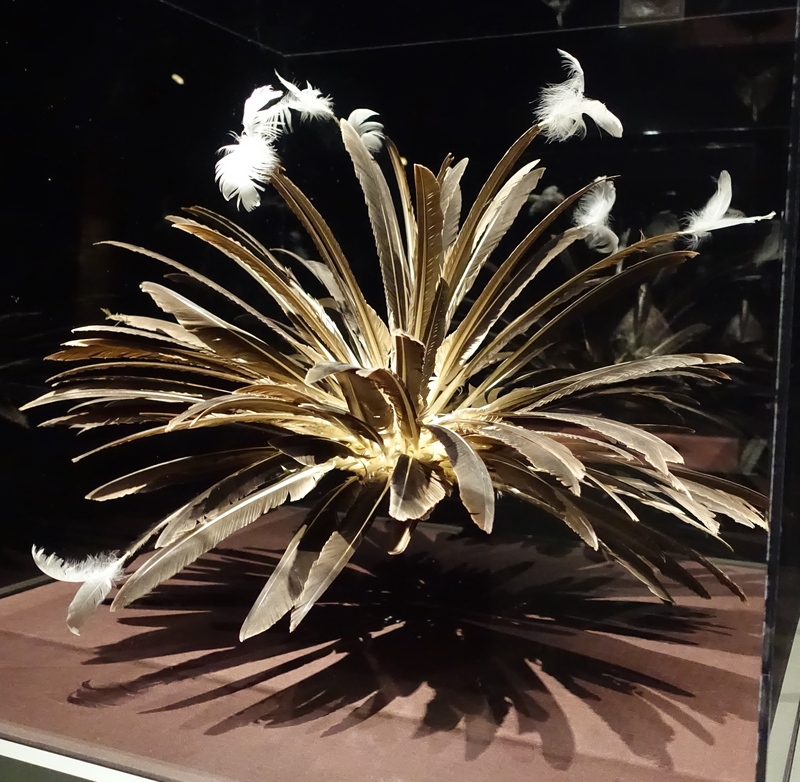 Baskets are made of grasses and sometimes of shells and feathers. But as I mentioned earlier, the grasses were the first “people” and so these baskets were alive as well. All of their lives, they have had one constant—hands. The hands wove them, carried them and buried them with their owners. So the Council felt that they would be lonely in the glass-encased wall. The videos of the hands weaving the baskets would keep them company. The basket in the above photo, from the late 19th or early 20th century, is a Pomo Ceremonial basket in the “Sun Basket” style. If you were invited to an important person’s lodging for a meal, you might bring such a basket with you. The bottom is covered with red feathers from an acorn woodpecker’s scalp and blue feathers from a western bluebird. 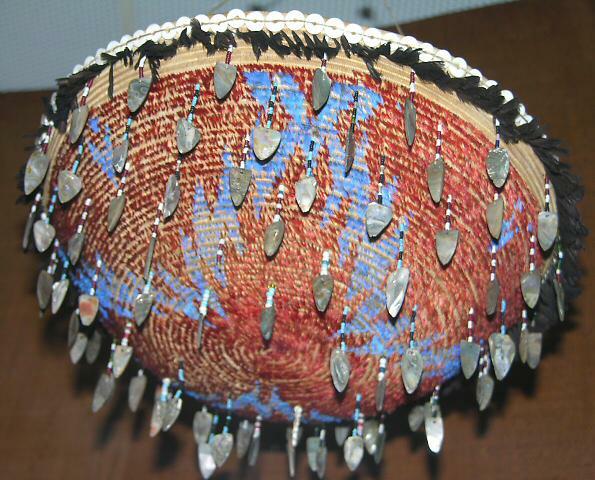 The edging is composed of Valley Quail top-knots and sculpted pieces of abalone shells hang from the edge. Clamshell disks, shaped by rubbing them on stones until they are all identical in shape and size, decorate the edge. There are also Italian glass beads. Baskets like these could also be gifts for a special occasion, such as a wedding or a funeral. In the case of a funeral, the baskets were cremated along with the deceased. That is one of the reasons we have so few baskets remaining. Something very important that I learned from this docent was to bring a flashlight on my tours. Although this is a very good photo of the basket, in the gallery it is darker and hard to see the bottom of the feathered baskets. Now I always tuck a little flashlight in my pocket. My other favorite basket, which I love to talk about, is this woodpecker trap. Because ceremonial baskets were a sign of wealth, having lots of woodpecker feathers on hand to use was also a sign of wealth in a community. The Native Americans made a special basket to catch the woodpeckers with care. Woodpeckers live in trees and access their nests through a hole. If you remember Woody Woodpecker, he had a small hole to get into his tree. There are several varieties of woodpeckers, and some make larger holes. The young hunters in the village are responsible for creating their own baskets. A hunter would climb up the tree where woodpeckers live, usually at night after they have returned from the day’s work. One method of catching a woodpecker was to strap the large opening of the trap over the opening of the hole and return the next morning after a bird was caught trying to leave the nest. Another method was to take another hunter along. He would climb the tree and hold the trap over the hole while the other hunter remained below and hit the tree with a stick, frightening the bird and causing it to fly out into the trap. I often have our young visitors pretend to be a woodpecker in the tree, while another pantomimes attaching the trap and striking the tree. It is my opinion that the shape of this trap catches and cradles the woodpecker in a humane way until its captor can give thanks for its life, kill it and use all of its parts. This may seem like a lot of Native American focus, when this is supposed to be a Gold Rush Tour. But we want the students and adults to understand what came before the Gold Rush and how the Gold Rush changed the lives of these native peoples. So you have to learn about what came before, much in the same way parents feel it is important to recount their own childhoods to their children. In addition to the baskets and Maidu painting, I decided to learn more about the meeting of the Indians and the Spanish in Southern California so that I could linger longer at the unusual multi-sensory bay Distant Travelers Arrive. 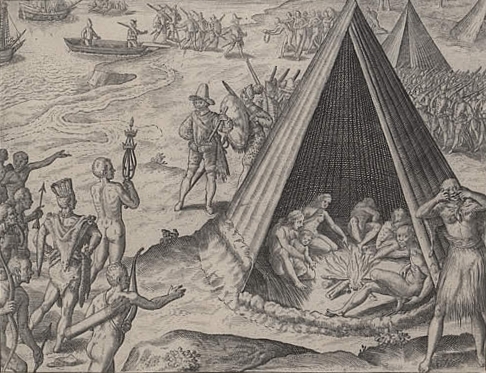 At the entry to this bay, visitors see a drawing of the two cultures meeting, depicting the arrival of Sir Francis Drake in 1579, made some years after his arrival. The Spanish soldiers are dressed in their heavy uniforms, with their helmets and their spears. The Native Americans are naked. The juxtaposition is stunning. The facial expressions of the natives show anxiety and fear. The day I stopped by to ponder this experience, I tagged along (professionally known as “shadowing”) with a tour in progress given by Pete. He is a veteran docent who has made history come alive for me especially when I am not as familiar with all of the content. “Let’s look at this drawing. What do you see?” he asks the students in his group. “Yes, they are. Why wouldn’t they need clothes? “The climate is so warm in California, so they don’t need any,” a student offers. After this, a discussion ensues about climate issues. This is exactly what you want to stimulate. The students are making connections to their own lives from the days of the 1500’s. Lots of conversation happens among the class about how the two groups might have come to understand each other eventually. Next, Pete turns to the cases in this dimly-lit room. 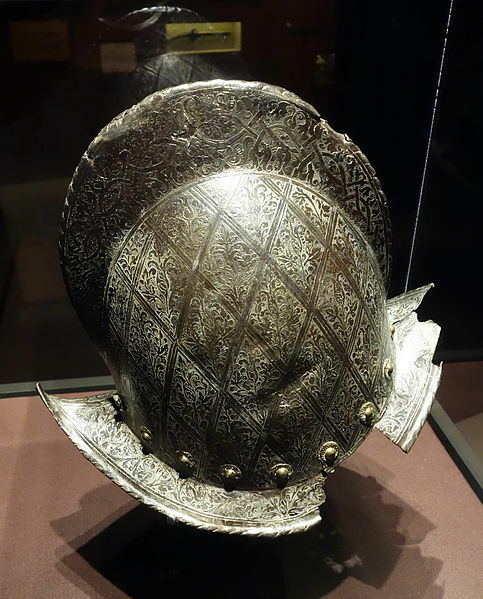 One case holds a Spanish, steel infantry helmet called a morion, from the 17th century, and the other case a ceremonial topknot traditionally worn by the Indians of Central California. The class wants to know more about how the topknot was made and why it is so silly looking. “What sort of materials did they have to work with?” Pete asked. Pondering this question, the class decided that these people were pretty clever using what they had on hand. This is a recurring theme I find with these early Californians. “What do you think the Spanish thought of the topknot? Would the Natives have wanted to wear a heavy metal helmet?” These are a couple of questions I thought of later to add to my own tour. The authentic helmet is of steel, hard, heavy and cold. The topknot is of pelican feathers, light, organic and fanciful. The topknot is new and was made by Linda Yamani, an artist and one of the Rumsen Ohlone advisors to the museum. Such important thinking, wondering and questioning has taken place in this little room. Before leaving this room, Pete has the class look though the glass to the opposite wall, pointing to a porthole that has a video of the ocean. I usually have some trouble keeping the group together at that wall. The classes always get very excited with the motion out the porthole. I will try using Pete’s idea of having them view the porthole from the enclosed room. The next few weeks of Gold Rush Guide Training, we practiced our additions to our tours and got to know our next crop of Gold Rush Guides. They were enthusiastic, and we, the old hands, were encouraging, and mentored them when asked. My first tour after the retraining did not go as I had planned. I was excited to spend more time with the baskets and in the Distant Traveler’s bay. But the teacher did not want much time spent in the Native American gallery. As I mentioned before, this is an important starting or ending point, as a place to compare where we came from historically. And more than one exposure is needed to learn all that there is to glean from the lives of these early peoples. I did my best to honor the teacher’s wishes and choose only one connection to the Gold Rush linking the Native Californians. We have a case that represents a Native Californian’s kitchen with a winnowing basket, acorns, a mortar and pestle for pounding the meat of the acorn into flour, and a hopper and other baskets for preparing acorns for consumption. Whenever I tour, I ask the students what was like gold to these early Californians. I tell them that the answer is in this case. “Talk to the person next to you and see if you can answer what is so valuable in this case,” I suggest. But this group was not as interested in making this connection. They were here to see gold and after a few responses like, “We saw this in third grade,” I knew I needed to head to the alarmed case with the placer gold! But I have seen students have “aha moments” at the kitchen case, too. “Oh wow! The baskets and the gold pans are the same shapes and the acorns are just like gold nuggets.” This is the beginning of making connections. 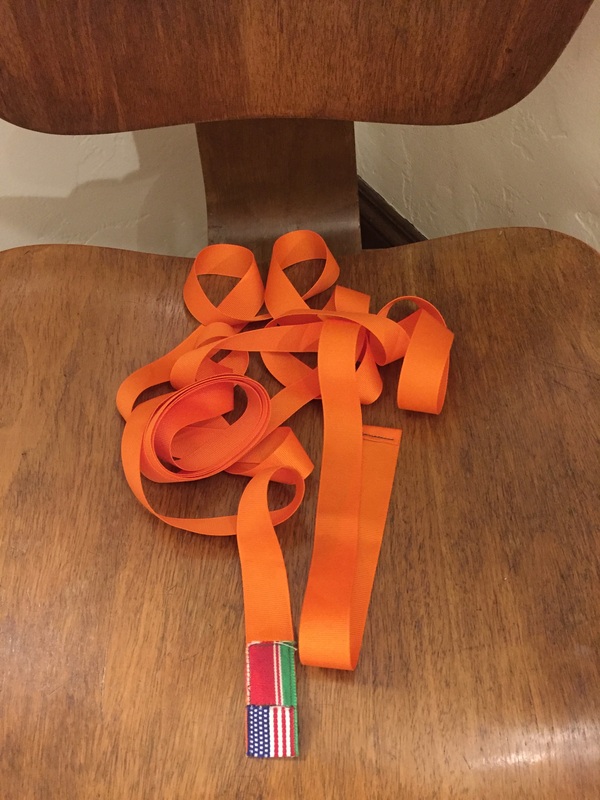 I also carry a 170-inch-long orange grosgrain ribbon I use as a timeline. At one end an inch of red, white and green striped ribbon is sewn over the orange ribbon, representing the period of Spanish and Mexican control over this area we call California. Next to it is a 3/4-inch piece of American flag ribbon representing how long California has been part of the United States. That leaves all but that 1-¾″ piece to represent the time Native Americans have been stewards of this land we call California. It is important to remind the students and visitors of this section of the exhibit, even for just a moment, that the Native Americans were here first. Now, when teachers request skipping the Native area, I swing by at the very end of the tour to briefly talk about the basket wall, or the kitchen area, to remind them of how all of this fantastic Bay Area began! At the end of the Gold Rush Tours for 2012, the Museum announced a training class for the 2012–2013 History Docents, scheduled to start at the end of September 2012 and end with our final tour evaluation October 2013. There would also be training for the 2012 Days of the Dead (DOD) scheduled on the weekends. I decided early on in the Docent training to skip the DOD touring. It was a good decision. 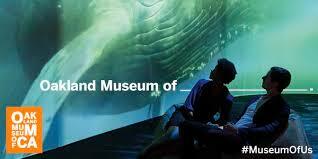 I would have been at the museum, either as a student or tour guide, almost every day of the week. As it turned out, I had plenty of homework to complete on the off days! So the fall arrived and I arrived—with notebook and mechanical pencil in hand. I had spent some time picking out just the right paper and pencil to take. I was officially back in school. Out of our GRG (Gold Rush Guide) training, about ten of us decided to take on the challenge of becoming History Docents. I joined my comrades in the conference room down the hall from the Docent Center on a Tuesday afternoon at the end of September 2012. We were a little pack among a group of 40-plus who arrived to discover what the next year would hold as trainees. I am that super enthusiastic person in the group who can hardly wait to get started. Kind of annoying to those who are new to OMCA and feeling a little intimidated about what lies ahead. We will be taking a college-level California History course. We must have a study buddy in case we miss something. We cannot bring pens into the gallery. We must be on time to class. We will have an additional training after each class in the history gallery for two hours. There is a reading list of “must-reads” which have to be completed. There will be quizzes and homework to complete. There is a two-year commitment for touring after the training, which will also include Gold Rush Tours during this training. Most people unfamiliar with the inner workings of museums do not realize what a wealth they have in their docent tour guides. There is no surprise when visitors say, “Wow, my guide knew so much!” Docents across the United States in the major museums, of which the Oakland Museum of California is one, receive between one and three years of training, depending on the size of the collection the docents need to study. Some of the museums’ trainings, as with SF MOMA and the De Young, involve not only study, but memorization of a script to deliver to the visitors. Other training programs, like ours, involve study along with the freedom to interact with the visitors. This gives the docent the ability to tailor the tour to the group. It also makes the visitor feel more included. Most of the museums I have visited practice the script method. 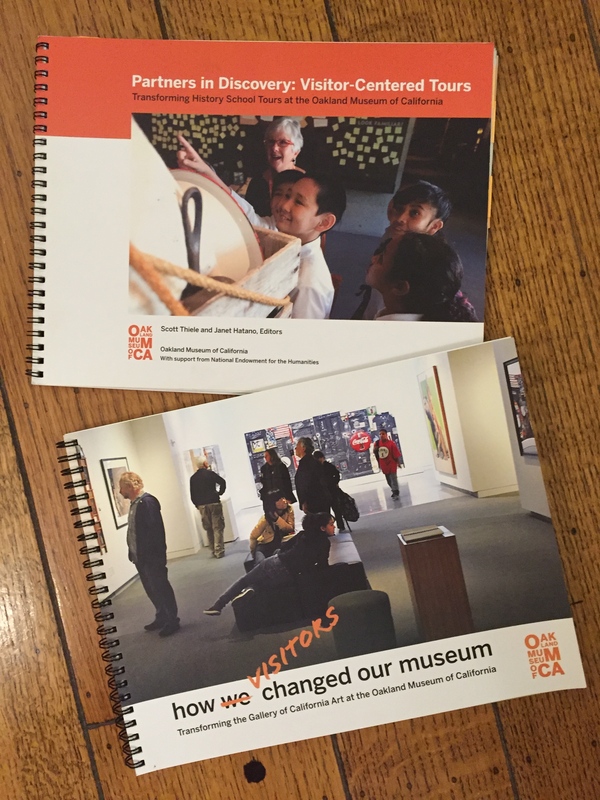 Since my Visitor Centered Training (VCT) at OMCA, I see the significant benefit of VCT every time I am either a visitor in another museum or a tour guide at OMCA. In almost all of the tours provided by Bay Area museums, visitors hear only one voice—that of the tour guide. Questions are not encouraged and there is little flexibility. The Guides have a script, which does not leave any time for conversation with their visitors. SF MOMA’s docent program, called Museum Guides, includes a similar in-depth study of the permanent collections, which takes a year, and the trainees are required to sign on for an additional year of touring after the training. The difference in the title “docent” vs. “guide,” is important. The word docent comes from the Latin docere which means “to teach.” And I think of us at OMCA as teachers who are interested and encouraged to do what teachers do—help our visitors observe and learn about our collections with our assistance. That teaching also includes engaging with the visitors and finding out what makes them tick. The idea of a guide doesn’t always include the goal of teaching; instead guides are meant to help visitors find their way through the galleries. We want everyone to find their place here and we are succeeding! That first meeting, after the break, Mitchell commented that we had already lost some participants. He asked us not to take the readers if we thought that we were not going to move forward with the training. Those of us who were going to continue received two readers: one for the course titled California History as Public History, taught by Dr. Linda L. Ivey from Cal State East Bay. 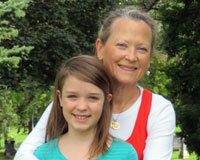 The other reader is a collection of articles titled, History Docent Basic Training, Supplemental Content Material. Both are 150 pages, double-sided. There would be more readers forthcoming during the year. I was a little nervous, but excited about our next gathering as I left the museum and headed out to Staples for more of the orange binders I first purchased during last year’s Gold Rush Guide Training. I was ready to roll! Required reading for all Docents and History Buffs!!! It helps me too! Every time I review my trainings, I learn more and more pieces fall into place that I might not have understood or even noticed initially. Thank you for commenting.